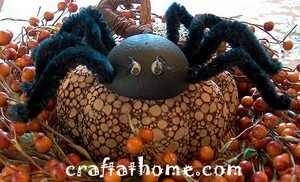 Set out some creepy, crawlie spiders to spook your trick-and-trick visitors this Halloween. Cut your styrofoam ball in half and paint each half with black paint. Allow the paint to dry. Cut 8 chenille stems in half (I used the really fluffy ones). Put a dot of glue on the end of each chenille stem and push the glued end of the chenille stem, through the foam, at the sides to create legs, as shown. Glue on eyes and eyelashes in the appropriate places. Bend the chenille stems to make the spider’s bent legs, then cut the ends of the chenille stems even. Poke a hole in the top centre of the foam (the end of a pen or pencil works well) then glue a piece of fish line into the hole to create a hanger. Touch up any white that may show through in the fish line hole with black paint.